A little less than a week before Apple's iPhone 5C is expected to hit store shelves and doorsteps of eager customers who pre-ordered theirs online, and we already have our hands on Apple's official accessories designed exclusively for the colorful and very much glossy polycarbonate-made iPhones - the official $29 iPhone 5C Case and the $29 iPhone 5C Dock. Head past the break for our in-depth, first hands-on impressions along with some unfortunate news about compatibility. Much like the iPhone 4 Bumper case, the iPhone 5C Case is packaged inside minimal and space-saving packaging presented clearly through a transparent plastic casing, ideal when there are 6 different colors to pick from. An interesting new design change we'd like to point out is that Apple has finally improved the way customers unbox these accessories. 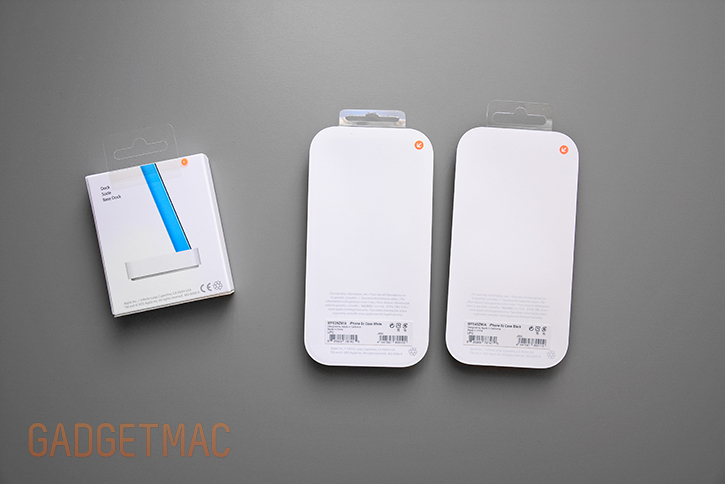 Each packaging now features a small pull tab for effortless opening. Our first impressions are very positive. It may have large grid pattern of perforated holes covering the majority of the case's back that may not sit well with some people notably because regulatory text is visible though the rear grid pattern (in that case we'd recommened you take a look at our entry iPhone 5C case guide), but in general we think the iPhone 5C case is really well made and has the same type of material and construction found on Apple's iPad Smart Case. The level of refinement and quality of it matches every other case Apple has made that features this rubbery polyurethane material. Instead of polyurethane which Apple uses to makes its Smart Covers, the iPhone 5C Case is made out of a silicone material that is backed by a microfiber interior support layer that gives the case rigidity as well as a non-scratching protective surface when rest against the iPhone 5C. The matte finish gives the silicone a smooth, soft finish that should look mighty nice against the glossy polycarbonate of the iPhone 5C - which was Apple's intention. We have yet to use a case that is uniquely made and highly refined as this one. It just feels different when held in person than any other case we've tested, and that's a good thing. So far we're quite happy with how the case turned out. It's worth noting that we noticed the black colored iPhone 5C Case attracted a lot of lint and would easily show oily fingerprints atop its matte finish. The iPhone 5C Case's rubbery silicone material should provide a light amount of protection against drops as it will absorb shock and impacts while keeping the phone scratch-free in your day-to-day usage. We say light because this is a very slim case and not one that has been designed to offer extreme drop protection. The iPhone 5C Case feels great in the hand just on its own, offers a bunch of grip and traction and seems like its got a sturdy perimeter that won't flex unnecessarily but will flex slightly to fit over the iPhone 5C without much effort. It's also worth mentioning that the iPhone 5C Case is very slim and features a thin unified cradle-like shape that has a very thin profile so we're glad that Apple made sure to strengthen the edges so that they don't sag or have any weak spots otherwise found around the bottom portion of the home button. This case seems to have a perfect balanced frame for a silicone rubber made case and that's impressive. We obviously can't test the fit until we get our hands on the iPhone 5C which we will then post our final review of the iPhone 5C Case, but for now we really don't see any negative drawbacks for this case other than its perforated design that may be a dirt and lint trap when put in the pocket. Contrary to earlier reports, Apple bewilderingly hasn't designed its iPhone 5C Dock to work with the iPhone 5C Case. The two don't fit together and that means you won't be able to dock and charge your iPhone 5C if you plan on using the iPhone 5C Case on or any other case for that matter. The iPhone 5C Dock has been moulded and shaped to precisely fit the naked body of the device and nothing else. 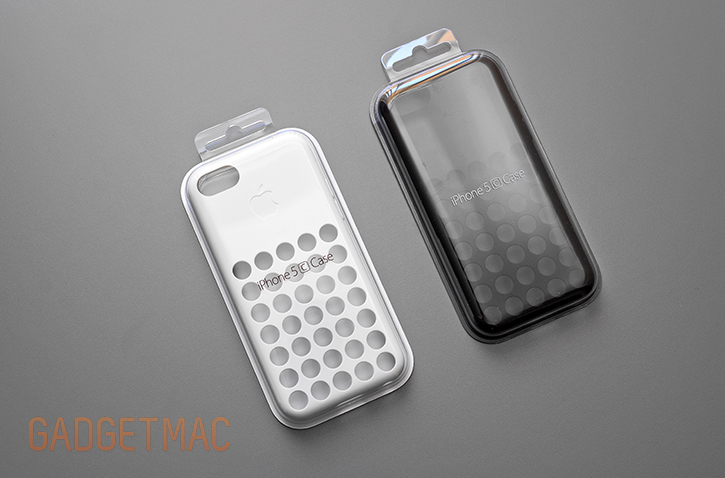 From what we can tell, we actually do think that many iPhone 5C owners will want to use the official Apple case to protect and add some style to their device, and it's odd that Apple hasn't considered designing two of its accessories to work with one another. Apple...you have greatly disappointed us.